« Favorite Things – Let’s Give Cookbooks! Mexican Stuffed Peppers – One of our favorite weeknight dinners. Colorful and sweet bell peppers hold a variety of savory and spicy ingredients which you can customize to your own tastes, preferences, and what you have on hand. I was never a big fan of traditional stuffed peppers because cooked green peppers tend to have a bitter taste. Adding hamburger and rice just really didn’t do it for me. My husband, however, loooooves stuffed peppers so I tried to figure out a way to make us both happy. Swapping out the green peppers for the sweeter red, yellow, and orange variety goes a long way. 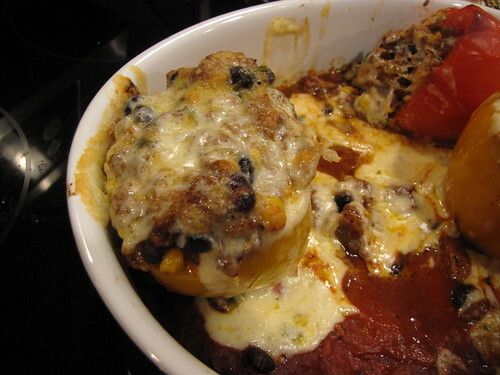 Adding anything with Mexican flavors, and of course melted cheese got me right on the stuffed pepper bandwagon. 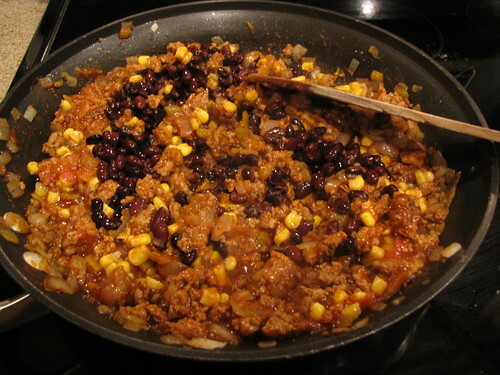 Bell Peppers, Onion, Ground Turkey*, Olive Oil, Black Beans, Frozen Corn, Diced Green Chiles, Salsa, Tomato Sauce, Chili Powder, Cumin, Pepper Jack Cheese, Salt & Pepper. As I mentioned, you can totally customize these for flavor or for what you have on hand. The first time I made Mexican Stuffed Peppers I happened to have some leftover yellow rice in the fridge so I threw that into the mix. For this batch, I didn’t want to have to make rice so I just left it out and didn’t miss it at all. *Also, feel free to use any kind of ground meat that you like. 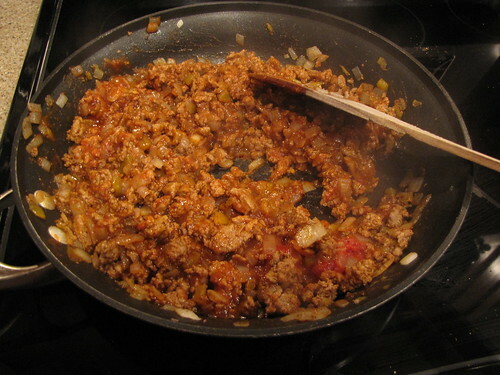 I’m using a little over 1 pound of ground turkey but ground beef, ground chicken, or even ground pork would be fine. In fact, I think you could use the filling for Tropical Pork Tacos and have a whole other delicious stuffed pepper option. 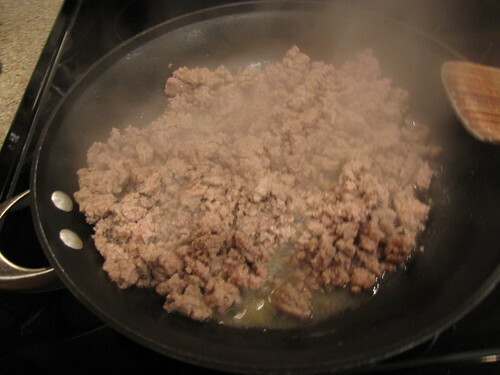 Start by browning your choice of ground meat in a large skillet. Since turkey is pretty lean, I added about 2 Tablespoons of olive oil to my pan and browned the meat over medium high heat. 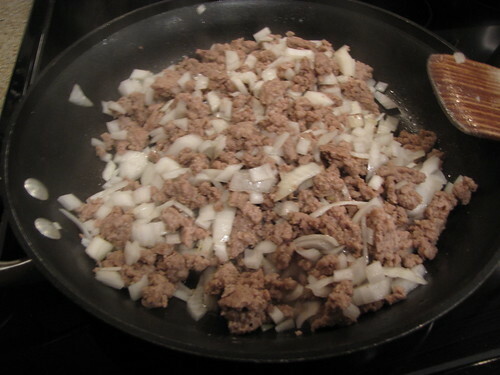 Once the meat has browned, add 1 large chopped onion to the pan. Cook the onion until golden and tender, about 10 minutes. Time to make this spicy and saucy. Turn the heat down to low and add ½-¾ cup of tomato sauce, salsa, or a combination of both. I use the tomato sauce because moistens the filling without adding too much extra heat. However, I usually end up throwing in a little salsa too just for a flavor boost. You will need to adjust the amount of sauce/salsa you use according to how much meat you have and how much moisture is already in the pan. You want this saucy but not runny. Drain and rinse 1 (15 oz.) can of black beans and add them to the skillet. Add 1 cup of frozen corn kernels and a small (4.5 oz.) can of chopped green chiles. Season with 1 heaping Tablespoon of chili powder and 2 teaspoons of cumin. Feel free to use more or less to taste. Sometimes I add a dash of chipotle chili powder for a little smokiness and kick. Taste the filling and season with salt & pepper. This is also your chance to make it spicier if that’s your thing. 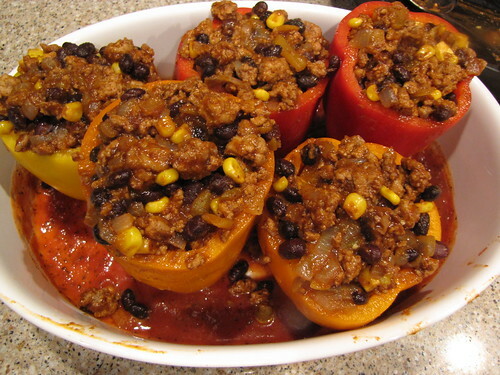 Let the filling cook and thicken over low heat while you prepare the peppers. 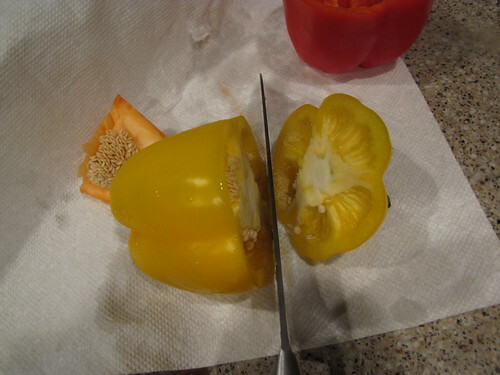 Cut the very top stem end off of each bell pepper and use a small knife to gently remove the seeds and inner membranes. If your peppers are too wobbly to stand up, carefully cut a very, very small sliver off the bottom of the pepper to make a sturdy base. Be careful not to cut through the bottom of the pepper though or it will leak while it cooks. Choose a baking dish that will hold your peppers upright and fairly close together. 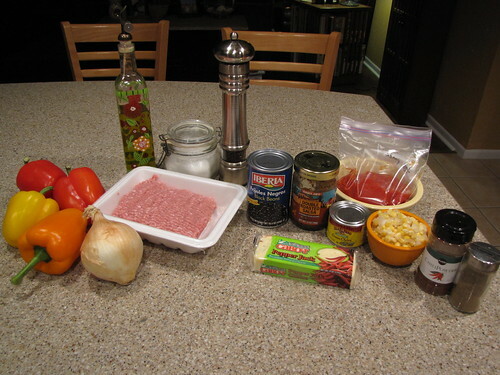 I usually add the remainder of the can of tomato sauce (plus some salsa) to the bottom of the dish to make a little cooking sauce. If you don’t have extra sauce, add about 1/3 cup of water. A little cooking liquid helps keep the peppers from shriveling up as the bake. Depending on their size, this should make enough to fill 6 peppers. When your peppers have been filled and are standing nicely, cover the baking dish with foil and bake for 30 minutes. 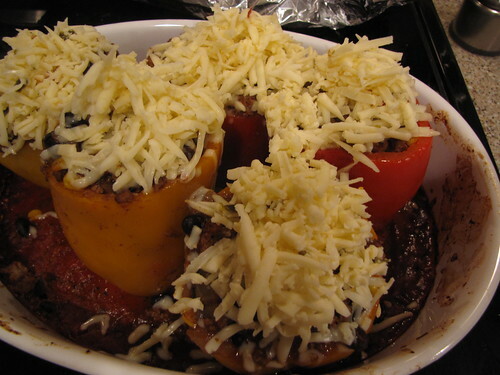 After 30 minutes, remove the foil and top each pepper with some shredded cheese. I’m using pepper jack but you can use any kind of melty cheese like monterey jack or cheddar. Put the peppers back in the oven for about 10 minutes to melt the cheese. Serving tip, scoop each pepper out with a big spoon from the bottom. If you use tongs the peppers tend to break and all the filling falls out. Oops. I served my Mexican Stuffed Peppers in bowls to attempt to keep them somewhat upright. If you’ve added the sauce to the pan, don’t forget to scoop some of that out for extra flavor. If you want to go all veggie, you could add some chopped zucchini, spinach, or even some roasted sweet potatoes. 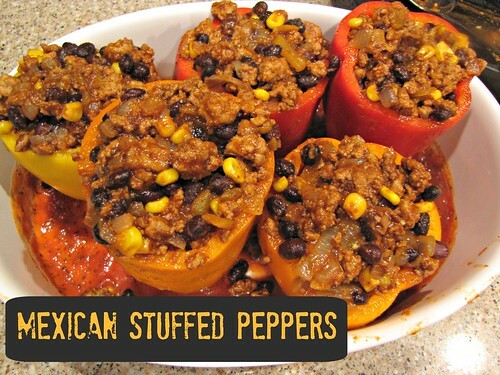 Basically any filling you would add to burritos or tacos can become stuffed pepper material. Even if you’re only cooking for 2 people, I would go ahead and make the whole batch. These were even better the next day for lunch so don’t worry if you have leftovers. Another option is to freeze half of the filling and then all you have to do is thaw it out and stuff away. That makes a quick and easy dinner even quicker and easier. I’m pretty happy with this south of the boarder upgrade to the good old stuffed pepper. I certainly wouldn’t say no to some fresh guacamole and a margarita to go with my Mexican Stuffed Peppers. I’m with you on green peppers. I’ll be trying this soon. 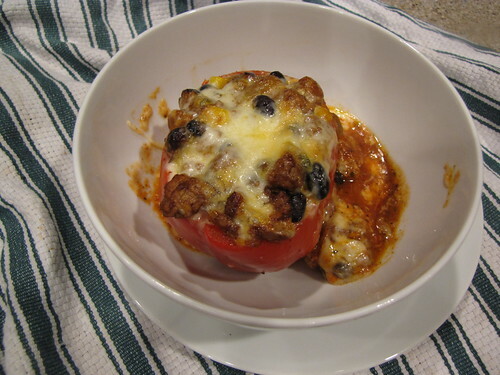 Jeff and I LOVE stuffed peppers…it’s one that we both agree on!! !